As soon as we bought our new house, I felt the pressure was on not to waste a moment and get on with the business of finding a builder. 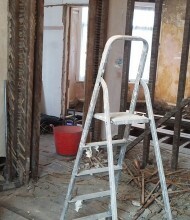 I had seven different builders come over to give me a rough idea of costs for the extensive building works needed. Horrifyingly, the first builder quoted a cost so high we could have bought another house at that price! Interestingly, not one of the builders turned out to be English. 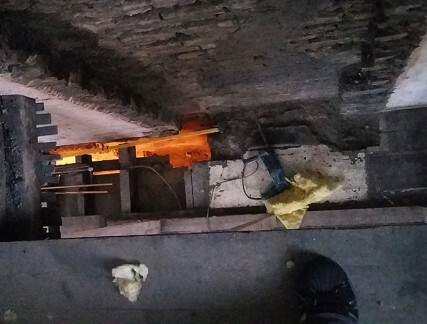 I ended up going with my gut feeling and asked Jonathan – a Chinese builder who bizarrely had a hint of a Yorkshire accent – to start the first part of the job immediately. 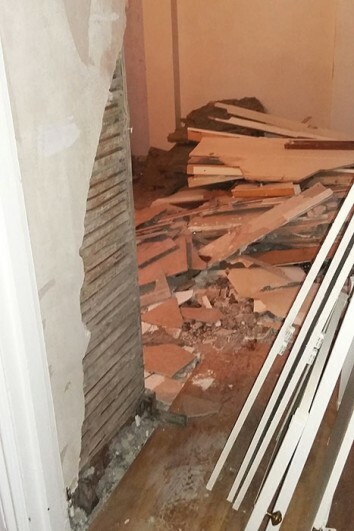 I would have assumed that the demolition and stripping out of a house is possibly easier than rebuilding it, but when Jonathan brought only two men for the job – Ming and Lin – I had my doubts. Ming turned up with a trendy haircut and slim cut jeans and looked like he might have just graduated from a graphics or illustration course at Central Saint Martins. Lin, while slightly older and more robust, was nonetheless still disconcertingly small. 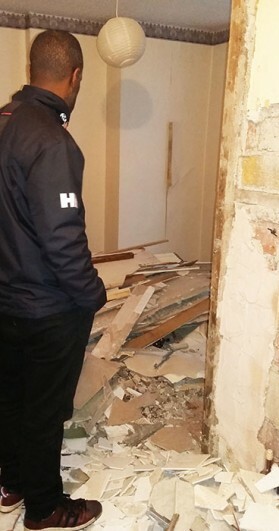 How on earth would just the three of them manage to dismantle and rebuild a whole house?! And yet within a few days, they had completely stripped back pretty much everything. I did not even have time to take photographs of the house before work started and half the house was in the skip outside! 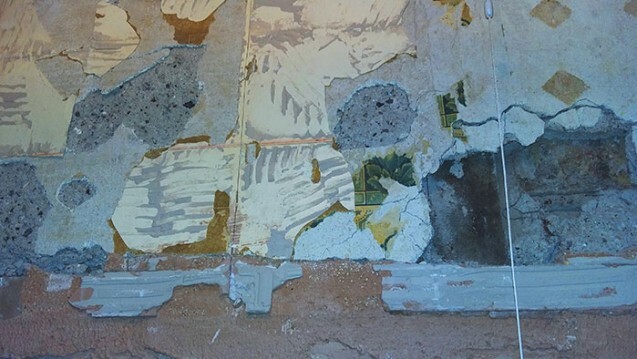 Layers of wallpaper, tiles, and plaster were stripped back to reveal the original lathe and plaster construction. 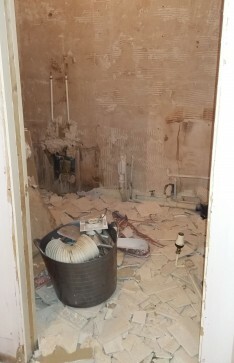 Entire bathrooms were reduced to piles of rubble and pipes…. above are pictures of before and after Ming and Lin had done their thing! 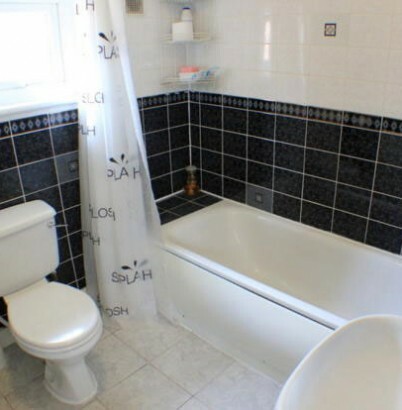 The bath in one bathroom was left plumbed in while the entire room was dismantled around it to reveal the fireplace and window of the bedroom beyond! December turned into a series of surprises. Every couple of days I would turn up for a site visit to find new things. 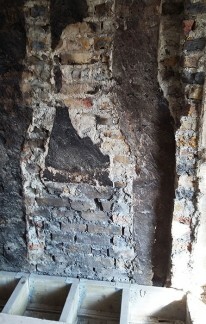 One time I walked into a room to find the bottom six inches of the wall missing (above, left); the next time I came in, all that was left was the original Victorian beams within the wall (above, right). 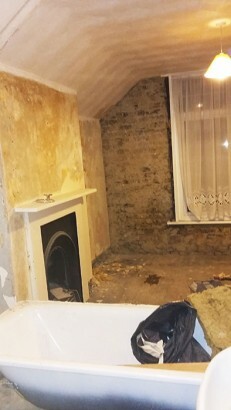 The back chimney was crumbling away so the builders removed the old chimney breast which connected three rooms at the back of the house. The brickwork left behind showed the shape of the chimney that had been hidden behind the wall all these years, but when I got too close I had the vertigo-inducing realisation that there was now a gap in the floor through which I was looking down three storeys to the ground (above, right). 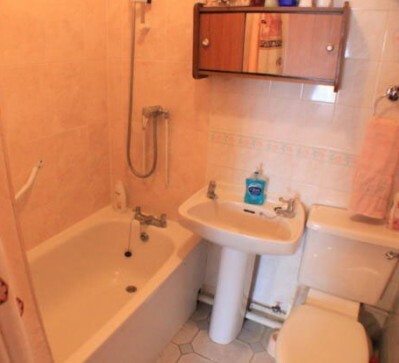 Eight skips were filled with detritus from the house and the space was cleared for the next stage after Christmas.